The engines failed to respond to a "demand for thrust"
Both engines on a plane that crash-landed at Heathrow failed to respond to demands for extra thrust, an initial report says. Despite continued demands for power the Boeing 777 "descended rapidly", landing short of the runway, the Air Accident Investigations Branch (AAIB) said. As the plane struck the ground on Thursday the right landing gear broke off from the wing, the report said. The jet encountered problems just two miles from the airport, it said. All 136 passengers and 16 crew on the British Airways flight survived. It was flying at a height of about 600ft (180m) when the engines failed to respond to a demand for increased thrust from the jet's autothrottle . After continued demands for increased thrust, and the "flight crew moving the throttle levers, the engines similarly failed to respond", the report indicated. "The aircraft speed reduced and the aircraft descended onto the grass short of the paved runway surface," it said. The plane was using an instrument landing system (ILS) approach, which allows pilots to follow a set path and be guided in, as it was coming into runway 27L at Heathrow. The report noted that: "A significant amount of fuel leaked from the aircraft but there was no fire." Earlier Captain Peter Burkill revealed the jet was brought in to land by the co-pilot. At a press conference before the report was released, Mr Burkill said Senior First Officer John Coward had done a "most remarkable job" in landing the aircraft. He also praised all the crew for showing "the highest standards of skill and professionalism". "Flying is about teamwork and we had an outstanding team on board," he said. During the emergency evacuation via the slides all occupants left the aircraft, one person suffered a broken leg and others received minor injuries. The AAIB said it had been notified of the accident within a few minutes and a team of inspectors had gone to the airport. US aviation authorities and representatives of Boeing were also involved, the AAIB said. 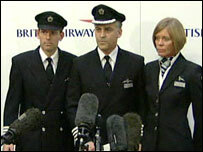 The BA flight crew were interviewed later on Thursday and the flight data recorder and cockpit voice recorder from the plane are being studied. An examination of the plane's systems and engines was ongoing, the AAIB said. In conclusion the AAIB said: "The investigation is now focused on more detailed analysis of the flight recorder information, collecting further recorded information from various system modules, and examining the range of aircraft systems that could influence engine operation." The AAIB hopes to publish a preliminary report within 30 days of the incident.